From Stairlifts to Disability Bathroom Conversions to Through Floor Lifts, we've got it covered at the right price! Welcome to Western Mobility - one of the leading suppliers of stairlifts, mobility scooters and Through Floor Lifts in Ireland. Based in Castlebar, Co. Mayo, we offer a wide range of disability aids designed to increase accessibility and comfort without breaking the bank. As one of Ireland's most trusted names for stairlifts, Though Floor Lifts and accessibility aids, we’re able to offer solutions for almost any staircase in your home. If you’re considering moving to a flat or bungalow due to the stairs in your home restricting your access - speak to Western Mobility and we could save you a great deal of time, money and upheaval. Our stairlifts can be fitted on straight and curved staircases, and their advanced design makes it easy for almost anyone to glide up and down the stairs in complete comfort and safety. Choosing from our selection of stairlifts is simple and one of our expert team can discuss the most suitable options for your home as well as any individual requirements. 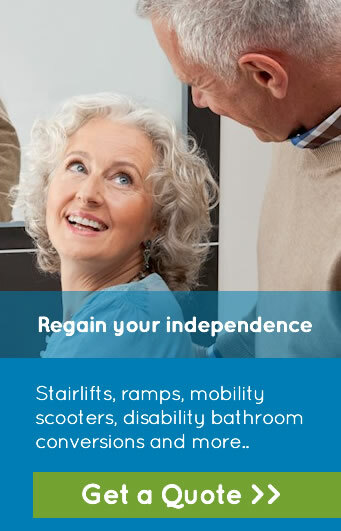 Maintaining independence in your own home is vital to enjoying the highest quality of living, and our entire range of stairlifts, mobility scooters and bathroom solutions have been chosen to offer you some of the most affordable disability aids that will give you the freedom you need at the best price possible. You can call us and speak to one of our advisors - we’ll be happy to discuss our stairlifts, mobility scooters, disability bathroom conversion, Through Floor Lifts or any of our disability aids with you.